Gmail went down today around 2:30 and I've been sitting here wondering what to do. 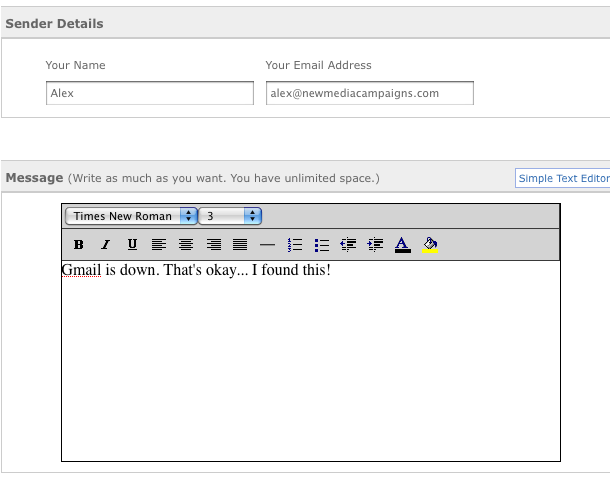 If only I could send an email telling my friends that gmail is down. Well here are 5 inconvenient alternatives to sending email. Gmail is down. Google Reader is not. Log in to your Reader account, find a worthless article and share it to your heart's content. And by content, I mean the content has to be 1000 characters or less. Depending on your category of friend, go to a site that will interest them and forward them an article that will interest them. Don't forget to include your message! For the advertising aware: Seth Godin is pretty risk-free. Looking for something a little more inviting? Why not try and Ecard. Google doesn't work. Why not send your business elsewhere. Sign up for a hotmail account. Use your name and phone number as your username and put in your friend's email address. They'll get a confirmation email with the message to give you a ring since you're unable to send an email. Go to a blog with comments. Make sure to check the 'notify me of follow-up comments'. Sign up as your friend's email address and comment-away your conversation. It's the time of year to get excited for Monday nights. Create a fantasy football league. Send out a few invitations, leave your message in the comments. Send an email and get a hobby for when you're not at work. Hell, this might be better than gmail. Here at New Media Campaigns, I have to admit that we rely pretty heavily on gmail. So when it went down we had to adapt. This is what we came up with off the top of our heads. You guys have any other ideas? UPDATE: here's a report on what happened.